You are here: Home / dinner / beef / The Best Steak Caesar Salad Ever. Really. The Best Steak Caesar Salad Ever. Really. 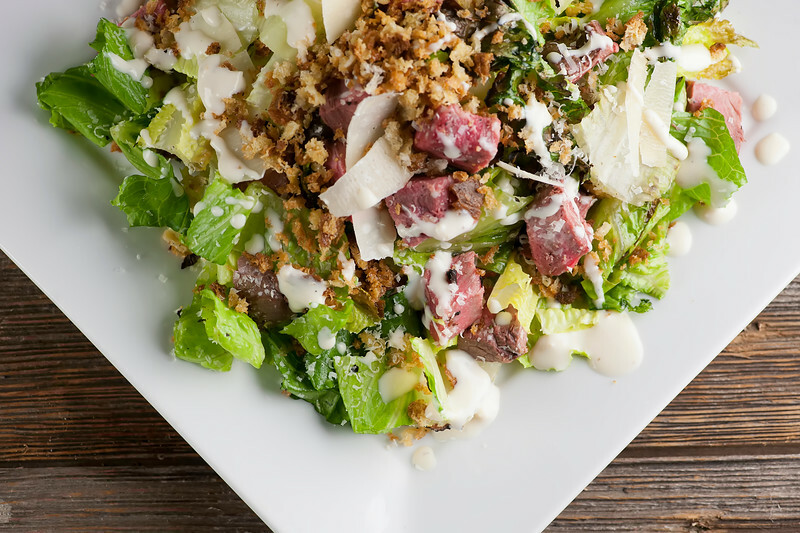 A few simple changes will make your next steak Caesar salad even more delicious than usual! 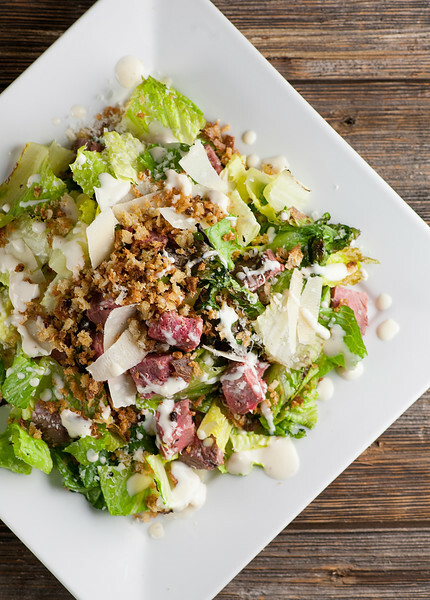 Breadcrumbs, cubed steak and just the right amount of dressing take your salad from good to the best steak Caesar salad ever. Really! I will freely admit it – I can be annoying to go out to eat with. Maybe it is because I am a food blogger (although I kind of doubt it, because all my wonderful food blogger friends are amazingly nice, sweet, the opposite-of-annoying people. David and Robyn and Lori and Lindsay and Kristen and Joanne, I’m looking at you guys. THE BEST.). Anyway, I can’t seem to get in and out of anywhere without psychoanalyzing the food…and it’s not only my own dinner. Nope, the Southern husband gets dragged into my crazy as well, which actually doesn’t work out badly for him because then I go home and start trying to reinvent whatever it was that he ordered. Sometimes it doesn’t work out…well. Like the 25 times I crashed and burned trying to make chicken fried steak. Those were dark days. But sometimes…oh sometimes I manage to reassemble a recipe into something that we both agree is pretty dang great. That could of course be his self-preservation instincts kicking in, but in the case of this Steak Caesar Salad, I do think I may have added something to the Caesar salad pantheon. See what you think!Here’s how it started. 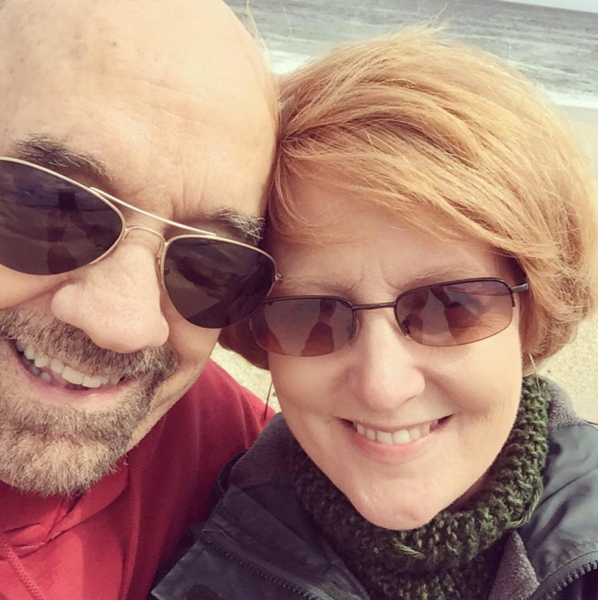 We were having a lovely weekend down the at the Jersey Shore. It was still the early edge of spring, but just warm enough to be able to walk along the boardwalk. Here we are soaking up the ocean air – don’t we look happy? You’d never know that in a short while I was going to pull my restaurant shenangans. So along comes lunchtime and we duck into a perfectly nice little beach restaurant. I can’t even remember what I had, but the Southern husband ordered, yup, steak Caesar salad…and it came out looking like it has the other 1,000 times he has ordered it. Romaine lettuce, lots of big croutons, ample amounts of dressing and three or four strips of steak on top of the whole thing. He picked up his fork and steak knife, and honestly, he looked perfectly content. Which is when I couldn’t help messing with his Caesar salad karma. So when we got home, I swung into action. We had a little leftover steak in the fridge, and I cut it up into bite-sized little cubes. I whirled a couple of slices of bread in the food processor and stirred them up in a skillet with a little olive oil and garlic and salt and pepper. If I had been really responsible I would have made some homemade dressing like this delectable one from Gimme Some Oven, but I used Boathouse Farms Caesar Parmigiano Yogurt Dressing and we loved it very much. So when dinnertime rolled around, I put some chopped romaine in a mixing bowl and used my (yes I washed them thoroughly) hands to mix the lettuce with the dressing. I drizzled and added, drizzled and added until there was just enough. Much tasting is required. I know, poor me. Next added the steak and tossed again. And last but not least, I divided it onto our plates, topped it with some shaved parmesan and a pile of those toasted breadcrumbs, drizzled just a teeny bit more dressing on top, and we dug in. No cutting up the steak because it is already in bite sized cubes. The breadcrumbs meant we could get a little of that great crouton taste on the same forkful as the lettuce and the steak. And because of all the drizzle-and-taste with the dressing, the whole thing tasted like salad with dressing and not the other way around. I definitely don’t always get things right, but I am ridiculously happy with my Steak Caesar salad hacks. Do you have a way that you’ve upped the game on a classic Caesar? TELL ME! Leave a link in the comments…I am ready for the next great Caesar salad adventure. A few simple changes will make your next steak Caesar salad even more delicious than usual! 2 cups steak, cubed. Leftovers are great for this recipe! Put breadcrumbs, oil, garlic, salt and pepper in a small skillet over medium heat. Stir continuously until crumbs are golden and crispy. Transfer to a small bowl. Put lettuce in a large bowl. With clean hands, add dressing in small increments until the lettuce is just coated. Taste as you go along! Add the steak and toss again. Divide among plates. Top with parmesan and bread crumbs. Drizzle on a little more dressing. Serve and enjoy! This looks so stinkin good. I have everything, including leftover tri tip, in the fridge. It’s happening. Normally I’m not a fan of the stuff on a caesar salad, but you’ve sold me on giving this a try. Crispied bread crumbs may very well be my crouton replacement forever! You can actually like, eat them without murdering your mouth ala capt. crunch… I’m sold, and I’m adding the missing things to the “Honey, on your way home” list for tonight. I sometimes make a pasta salad with the Caesar dressing…then serve with romaine and chicken. Will have to try it with the steak and bread crumbs…sounds delicious. Ooooh, PASTA Caesar salad! I’m going to try and mixture of that idea with the steak and breadcrumbs – I’m thinking it will be a slam dunk! In Arizona I ordered a Caesar salad and it was served with wedges of lime. Terrific addition as the final touch! LOVE the lime idea! That’s definitely getting added to my Caesar salad plans. Steak in caesar salad?! Where has this phenomenon been hiding all my life?! Yay! You did it! This sounds amazing!!! Thanks Karen! I do think we are never going back, steak-caesar-salad-wise! My kind of salad is one that I can eat with a large spoon, instead of trying to chase the ingredients and stab it LOL! Love this salad. My grown son comes over a couple of nights a week for dinner. I gave him a choice of Caesar salad with steak, or just steak and potatoes. So I went scrambling to find something better than my usual random Caesar salad, and you’ve saved the day! I usually use Ken’s light Caesar Salad dressing, and (ouch) the great big croutons that make it a bit harder to enjoy every bite. So, I’m going to crunch the croutons, quick pan cook the thin strip steaks, then slice into bite size pieces. Your recipes are usually adaptable to what I have on hand, and what we like, and I’m a fan of you blog! I don’t tell you every time I use your recipes, but I’ll try to step up on that. Next time I write, I’ll give you a list of all the recipes I’ve used, loved, and make over and over. First of all, you are SO lucky to have your son so close – my daughter is all the way in North Carolina (I’m in New Jersey) and I love it so much when she comes home. And second, sounds like you did a fantastic job customizing this recipe, and you are so nice to leave this comment – I love hearing from my wonderful readers. Happy cooking, Joyce! I do love your blog, and thank you for responding. Your blog is actually my first choice when I’m looking for new ideas. The pioneer woman is second. I just like your’s best. The Salad with Steak turned out well, and was filling enough that we didn’t need any of the cabbage soup I’d made. Cabbage Soup used to be a diet plan, where you could eat unlimited amounts and then add other things that were ‘allowed’. I’ve not found any of these crazy diets to be all that good, but the cabbage soup was actually delicious! Chopped cabbage, sliced carrots, onions, celery, garlic, frozen green beans, canned diced tomatoes, simmered in chicken broth, with some italian spices, and a couple of TBS of lemon juice added at the end. While it’s pretty much low cal, and healthy, it’s also delicious. If you’re interested, I can’t wait to see your swing on this!